I have to confess....I have never played Bunco. And I really don't know what it is other than a dice game. A few months back a MB member asked me to make an invite in the shape of dice for her. I didn't know if it would line up right or not. I never heard from her after I sent her the file so I chalked it up to a crappy cut file LOL. I sent her the cut file for the BUNCO INVITATION CARD and sh e cut it right away. She said she loved it!! I left the top without dots so you can put "You're Invited" or "Bunco Party" or what every you want. 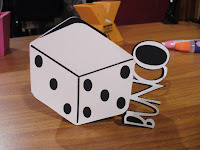 Also you can delete the word Bunco if you just want a dice card for something else. I can't even remember what size the card is now. But ScrappingRT did say it lined up and cut perfectly! You are the best! I have bunco parties all the time and I'll be able to use this. Thanks so much! I dont know what a Bunco is either But U sure did super with the card.U so SMART!!!! I am sending you the Brilliante Weblog Award. You are such an inspiration to us all. You help us all out so much with all of your designs. You are so generous. See my blog for rules. I hhave never played bunko But you did a beautiful card!! Cute card. I nominated you for a blog award. The details are on my blog. Maybe it will help you with some sales. Make the money girl!!!! :) They are so cute BTW!! Great idea once again. Love your cuts. Is there anyway you could make a Wall E cut??? My son's birthday party is going to be wall e themed. Thanks!!!! I play Bunko every month - this will perfect for the next time that I have to host! Thank You for sharing your cut file. My mom does Bunco every month and she's going to love it. I am having a bunco party new years eve......and thank you for these invites. Just made them..they are amazing. Love it. Thanks. So glad you could use it Sue! I still haven't played the game myself but glad people are able to use the cut file!